Posters for the “I’m Not Your Inspiration” awareness campaign by the Indiana Governor’s Council for People with Disabilities. In one, a portrait-style photo of a boy is juxtaposed against an orange backsplash with text that reads: I’m Not Your Inspiration (I’m Your Classmate). 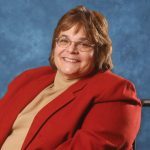 In a column for Phi Delta Kappan, a professional journal for teachers, Silverman discusses the challenges of reporting in schools and the ways in which journalists still far short when it comes to telling relevant and nuanced stories about people with disabilities. Read more of Amy Silverman’s column online.